This is true literally and figuratively. One person never makes a team. Professional sporting organizations have shown us that all-star athletes like LeBron James can help a team's success. But even "King James" can’t single-handedly carry an entire team to victory game in and game out. I know the workplace is not a playing field or a sports arena, but professional sports organizations have embraced an important concept that can be almost foreign in some of the most successful businesses around the world: cross-training. Cross-training is simply teaching or training employees the responsibilities or duties of another position to increase organizational efficiency and effectiveness. Cross-training is actually crucial to the success of a business. Let’s say the Seattle Seahawks decide to solely train Russell Wilson as the only quarterback, that he is the only player who knows the plays and runs from where the quarterback stands. What happens if Wilson gets a season-ending injury the first game of the season? Without cross-training in place, the Seahawks would be facing a pretty rough season -- and some angry fans. But with second- and third-string quarterbacks in place, as well as offensive players being cross-trained and well versed in the plays, formations, etc., the team can rest easy that they won't face a painful season of losses and booing. Employers that choose not to cross-train operate at a huge risk. In today’s society we are all trying to do more with less. Cross-training is a concept that fully embraces the more-with-less concept. Cross-training employees not only allows for a back-up player in case a team member happens to get put on the disabled list or goes to a different team, it also helps build morale. Employees feel valued when a company is willing to invest time and resources into helping them expand their skills and knowledge. Cross-training also encourages strong, teamwork-centered environments where employees actively support each other because they understand and relate to co-workers in other positions. The are extremely efficient if an employee resigns, goes on vacation or even is out for a day or two with the flu. Cross-training ensures business continuity and success. While cross-training may take planning, time and resources, it is worth it. You can let King James lead the team to a championship, but he decides to become a free agent the lack of cross-training could certainly hurt your business’ chances at reaching the playoffs next season. 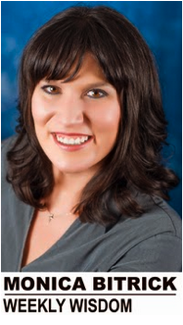 Monica Bitrick is the CEO of Bitrick Consulting Group in Idaho Falls.